But when is a relationship “proven”? What is “proof”? (or a “confirmed” relationship, or whatever other terminology you use). 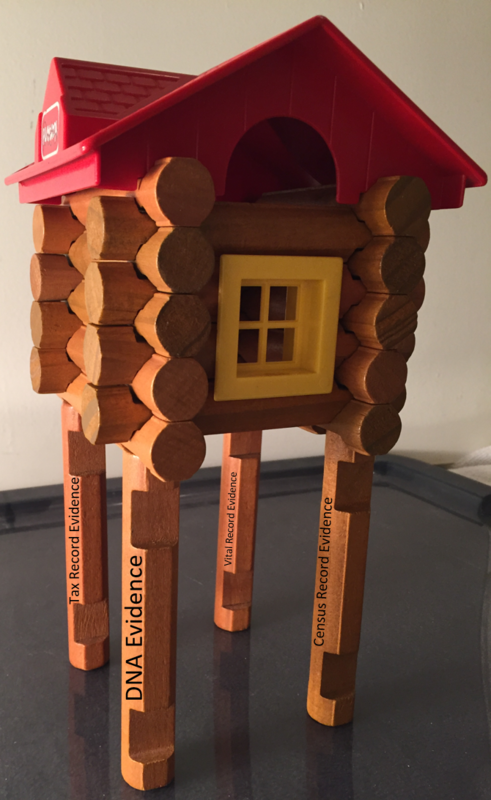 Evidence Explained defines proof as “a conclusion based upon the sum of the evidence that supports a valid assertion or deduction (i.e., a conclusion drawn from aggregated clues).” Elizabeth Shown Mills, Evidence Explained: Citing History Sources from Artifacts to Cyberspace, 2d ed. (Baltimore, Maryland: Genealogical Publishing, 2012). If we take this as the definition of “proof” or “a genealogical conclusion,” when does DNA allow us to prove something? DNA is appropriately recognized as being an important aspect of genealogical research. Indeed, the modern genealogist who ignores DNA does so at their peril; beware a genealogist that intentionally ignores any potential source of evidence. Although DNA is widely consulted as a potential source of evidence, there are no guidelines for how it should be utilized, or how it can be or should be incorporated into non-DNA evidence. Although there aren’t perfect bright-line rules for how any evidence should be utilized, there is also no historical treatment of DNA evidence as there is for other types of evidence. We’ve all read many proof arguments that include evidence gleaned from census records, probate records, and other widely-used sources. But few of us, actually, have read detailed and complete proof arguments that include evidence gleaned from DNA (where “complete” means the whole picture, both DNA and non-DNA evidence). NOTE: Anyone interested in how DNA and non-DNA evidence are incorporated to arrive at a genealogical conclusion must be members of the National Genealogical Society to receive the NGSQ (National Genealogical Society Quarterly), and must subscribe to The American Genealogist. Both contain articles that utilize DNA, and will undoubtedly continue to do so. NOTE: I recognize that even the term “non-DNA evidence” is problematic, as it suggests that there is a [non-existent] difference between DNA evidence and non-DNA evidence. So, use the term cautiously. Since DNA is such a new record type, genealogists are unsure how to incorporate the evidence into a genealogical conclusion. And new test-takers without research experience tend to focus solely on the DNA, without realizing that it is no more important than the non-DNA evidence. Indeed, DNA evidence has largely been divorced from – or, more accurately, never properly married to – traditional genealogical research. The answer to these types of questions is ALWAYS “it depends.” It depends not only on the many factors involved in DNA analysis (more on that in a bit), but it also depends on ALL the evidence that has been gathered, including the DNA AND non-DNA evidence. But when relying on the DNA ALONE, the answer is ALWAYS NO! 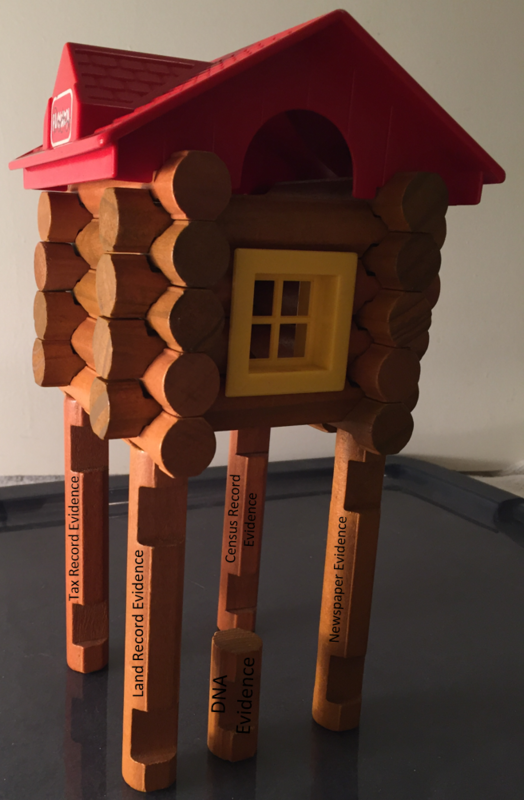 Each of the on-end Lincoln Logs is a piece of evidence supporting the genealogical conclusion (the suspended Lincoln Log building). Each log can be any evidence from any source. In the example above, there is a minimal amount of evidence supporting the conclusion, including the DNA evidence. What is clear is that the DNA evidence alone cannot support the conclusion. Indeed, without any of the evidence, the genealogical conclusion is inadequately supported and comes crumbling to the ground. Also in this example, the DNA evidence is essential to the conclusion; without it, the conclusion will fail. But, if someone were to present the DNA evidence to you without the other supporting evidence, you are completely unable to evaluate the genealogical conclusion. This is so often what genetic genealogists do when presenting their DNA evidence; the DNA evidence is divorced from or never married to the non-DNA evidence. 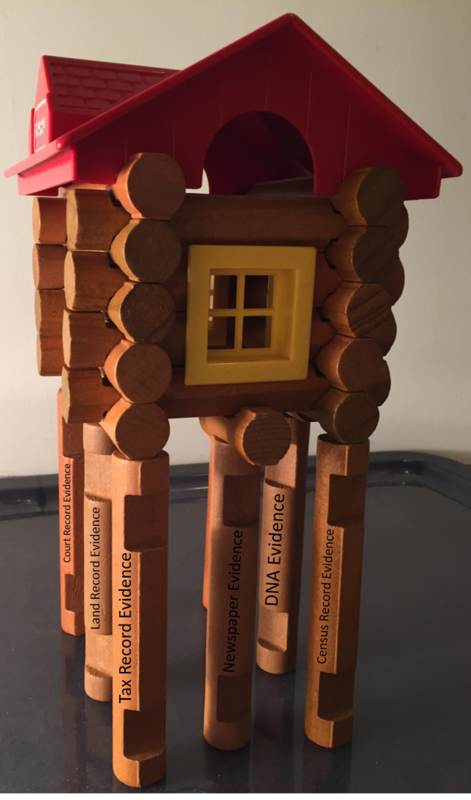 In this scenario, where the DNA evidence is either unavailable or not helpful, the non-DNA evidence must be sufficient to support the genealogical conclusion without DNA. Unfortunately, we can’t test our genealogical conclusions using gravity to determine whether they are sufficiently supported. Instead, every genealogist individually determines whether the gathered evidence stably supports a conclusion. When we share that evidence and conclusion with other people, they in turn analyze the evidence and decide whether the conclusion is sufficiently supported. This is where the Genealogical Proof Standard is essential, as it provides a framework for creating and reviewing genealogical conclusions. Indeed, it is at this bottleneck – determining whether ALL the evidence, both DNA and non-DNA, supports the genealogical conclusion – that genetic genealogists should be frustrated, not whether the DNA evidence proves something. That is not, however, what I am seeing in my discussions with genetic genealogists. Does the DNA Evidence Support the Conclusion? Whether the DNA evidence supports (versus proves!) a hypothesis or conclusion is an entirely different question, and is the one that should be asked. This requires an in-depth analysis of the many specific issues that arise when utilizing DNA, and this is something with which genealogists are still struggling. Tree Completeness – how complete are the trees you are comparing? In other words, how confident are you that the DNA couldn’t have come from other shared ancestors? Segment Size – are you avoiding small segments (<5 cM) and ensuring that the shared segment size(s) are reasonable in view of the hypothesized relationship? Total Shared DNA – are you ensuring that the total shared cM is reasonable in view of the hypothesized relationship? Each of these issues merits its own blog post and discussion. DNA alone NEVER proves anything. When you ask others to evaluate your genealogical conclusion, providing just the DNA evidence is pointless. Do not divorce one type of evidence from all the other evidence supporting your genealogical conclusion. P.S. – I used to say that DNA alone could prove a parent/child relationship due to that unique inheritance pattern, but I realized (with help from a great comment that I can’t find at the moment) that is inaccurate. Using current genetic genealogy tests, it is impossible to decipher (using just the DNA) whether a proposed parent match is actually a parent, or an aunt or uncle in the case of identical twins. For example, if two men are identical twins and one of them has a child, DNA alone (from current genetic genealogy testing, anyway) cannot determine which is the father and which is the uncle. Thus, knowing whether the parent has an identical twin requires non-DNA evidence! This is an excellent article. I also find your book, “The Family Guide to DNA Testing and Genetic Genealogy,” very helpful. Thanks. Thank you Elizabeth, I’m glad you are enjoying the book! Best of luck! Would you say that DNA evidence can, by itself, disprove an otherwise well documented/evidenced relationship? Great question! Although I wouldn’t say “disprove” (as it is just another way to say “prove”), it can be VERY STRONG evidence against an otherwise well documented/evidenced relationship. Fair enough, Blaine. That is totally true today. But I bet you that within 5 years, maybe sooner, we’ll advance autosomal DNA analysis to the point where we’ll solve these problems. Segment and crossover points will be able to be compared with double and multiple matching, match phasing will be perfected, X-chromosome analysis will be a big part of it, the very small differences in identical twins will relevant, and an algorithm will map all your ancestral segments on 46 chromosomes to placeholder ancestors with their descendant matches. Then traditional genealogy will be used to fill in the person of each placeholder. I’m so happy my Double Match Triangulator was selected as a semi-finalist at the RootsTech 2017 Innovator Showdown. I will get a chance to demo the first 2nd generation tool for autosomal DNA analysis, and maybe get some of the big players to want to help carry this forward. Hope to see you there and it would be great to spend some time with you. I saw that announcement Louis, congratulations!! Best of luck. Unfortunately I don’t attend RootsTech because speakers are severely under-compensated, but I’m sure we will run into each other at another event soon! Very clear, complete and concise. Thank you! Thank you Peggie, nice of you to say! Excellent post! Do you think that we are to the point that DNA has to be addressed in every case study as part of the exhaustive search? If DNA would not be helpful or impossible to obtain would you need to mention that DNA was considered and why it wasn’t used? Yes, we are definitely at the point where DNA should be consulted, if it is available and if it would shed light on the genealogical question at issue. There are MANY situations where no test-takers are living, where no test-takers are willing, and where no test results would be helpful, but we must consider it when we can. Great question! And the other side of the coin and what truly disturbs me is most people I have contacted at AncestryDNA actually think that a tree match is a concrete dna match. And some of these people have advanced degrees. That thought process does not even make logical sense. And, that AncestryDNA perpetuates that myth and they get away with it! Yes, there is SO MUCH misunderstanding by test-takers and genealogists at all levels. It is extremely important that anyone who understands and uses DNA help educate others. There is no question that the field has made incredible leaps in understanding in the past few years! While I don’t disagree with your premise, by your logic, all genealogical evidence is only support for the conclusion and nothing ever is proven no matter how much evidence exists. The apparent “official” standard of proof is nothing more than the “preponderance of evidence” often used in a courtroom. The logical end to your argument is that the standard is in itself not sufficient. It matters not what the “official” standard of proof is, you effectively imply that is is inadequate to prove *above and and beyond any doubt whatsoever* the conclusions drawn. The only proof of descent that might (!) work is observe the coupling and subsequent joining of egg and sperm, and the entire gestation and birth of each generation. Needless to say that is an absurd condition of proof. Having said that, you appear to constrain this blog entry to autosomal dna – the elephant in the room these days. Do you maintain the same position for Y-dna and mitochondrial dna? Were the remains of Richard III actually *proven* to be his when the conclusion was drawn using a comparison of mtDNA from a descendant of his sister, along with hearsay evidence of his burial in a location and the similarity of physical issues to he was said to suffer (and which some claim were effectively “false news” intended by his political enemies to make him appear evil)? The blog post merely says that DNA ALONE cannot prove anything. Period. More has been read into it, but that is inaccurate. DNA evidence MUST be combined with non-DNA evidence in order to arrive at a supportable genealogical conclusion. Period. And it is ANY type of DNA, whether atDNA, Y-DNA, or mtDNA, that applies in this discussion. Although I don’t think convergence is anywhere near as prevalent as some Y-DNA proponents do, it is an example of the Y-DNA evidence being highly misleading. Coming from a culture that not only emphasized oral tradition but many have learned to be wary of science like DNA, I see this divorcing between the two that still presents problem with overall genealogy among our community. I get tired of the same mistaken genealogical trees leading up to a few of these well known chiefs of the Hawaiian islands. DNA would help, but as you know my situation with my results, I have seen how people mistakenly use DNA as their proof since we all match each other anyway. Thank you for the very kind words Kalani, and for taking the time to say so! I have seen snippets of your research, and I know you definitely combine DNA and non-DNA evidence. Thank you also for your unique perspective from your culture, that is very interesting!! Thank you!!! This truly needs to said, again and again and again. Completely agree, Gayel! Thank you! Almost 20 years ago Helen Leary wrote that (paraphrasing) without DNA evidence one cannot prove a genealogical relationship beyond reasonable doubt. Reasonable doubt is the standard used in criminal law. Unfortunately many people expect certainty from a genealogical study, an illusion professional organizations do nothing to dispel by failing to set standards for confidence in genealogical conclusions. Twenty years ago that was understandable. Today we have examples such as the study that established with better than 99.99% certainty that the skeleton found under a car park in Leicester, England, was that of King Richard III. It drew together DNA, physical and genealogical evidence to reach that overall conclusion. The technique can be applied in genealogy as I attempted to show in an article Confidence and the Genealogical Proof Standard, Anglo-Celtic Roots, British Isles Family History Society of Greater Ottawa, Ottawa, Vol 22(1), Spring 2016. Short of that you fall back on the uncertain ground of rules of thumb, professional subjective judgement and assurance that professional best practice was followed. Agreed on all points. which is why I am excited about genealogy slowly moving toward probabilities. I truly enjoy the Richard III example, and I just learned about your recent article last week! How did I miss your article?? I joined the BIFHSGO just a few days ago to get access to your article, and I now have it downloaded. I can’t wait to have time to dig in! I expect to see much more of this type of genealogical analysis in the future! atDNA helped me go through 2 brick walls but without the 8 years of research that I had completed previously it would have ment nothing. Plus the composition of DNA an individual has is random, you never know which cousin, sibling, aunt or uncle has the key DNA to unlock the puzzle. All great points, Jan. The DNA evidence is so much easier to analyze when you have good non-DNA evidence in place. Of course this doesn’t apply to adoptees who can’t get the non-DNA evidence, but usually the DNA evidence is what points to the non-DNA evidence. Thank you Blaine Bettinger for mentioning -at least in small part-the plight of the adoptee, of which I am one. Those of us lucky enough to have some knowledge about our stolen identities are able, with a great deal of persistance and patience, to parce-at least somewhat- the maze of ‘documents’ (some valid, others not) to slowly unravel the mystery of ourselves; but in reality, all is circumstantial evidence rather than being absolute and immutable. Truth , like beauty, are in the eye of the beholder, and certainty is the province of the egoist. In 2008 I dd the first DNA Ancestry Project testing hoping against hope that I could locate my two siblings. A few years later, through pure luck, I was reunited with an uncle who knew me before the age of 2, along with my younger siblings, both of whom were separated from me and one another by our parents’ choice to abandon me and my sister who was about six months old. I suggested that he do testing just to confirm to others that I was not the imposter they accused me of being. The relationship was ‘confirmed’, but without the scientific numbers or proper explanations. I am no geneticist, so rely on others to be diligent and properly trained to determine for me what I cannot do for myself. Imagine my chagrin when, due to records (military and other) which disproved/disputed the probability or even possibly that the man named on my birth certificate was the one who fathered me, to find from the lab who initially said my uncle (brother to my father) was my uncle reversed their earlier finding to be absolutely certain that he shared no genetic material with me. the lab refused to re-do the analysis unless I paid to have them do so and even wanted me to do a ‘paternity’ in addition…. I had another lab-one which had done mine as another database for my sister to show up on- re-do my uncle’s tests and discovered happily that he and I share 1,740 cM over many strands of DNA. I sent these results and the numbers to the first lab, only to receive a response that their test was accurate… as if they were infallible! Even the SNPs of the two labs were vastly different. I intend to have one more lab do my uncle’s tests to confirm the amount of cMs between us. I’ve had five tests which have calculated my Haplogroup, four of which confirm J1c , one of those four has extended it to J1c16, and the fifth…. ready?… stopping at a branch from L3 to just R2-JT… and daring to suggest that their determination is based on their database and their phytogenic tree… Someone evidently pruned their tree way back -lopping off several twigs, including the last one which is J1c16-a new twig ca 2012. As for non-DNA ‘evidence ‘, my parents have no known marriage certificate, yet have 3 children whose birth certificates bear both of their names. I have the copies as circunstancial evidence for my own narrative and for my sister should she ever match with me on a database. To find ‘proof’ about me, one would have to know the whole complicated history-from birth to now to play the genealogist game-one so insistant on paper that they get caught in their own delusions. And my brother? He died in July 2011, about three months after I found my uncle, who just celebrated his 91st birthday earlier this month, too late for us to reconnect. The proof that he, my sister, and I are siblings lie in a photo that is my Facebook profile. Genes and genomes are everything! My daughter looked exactly like her aunt at a little younger age. Adoptees and connecting are … Complicated. Just ask me or others. 100% proof, no, but close enough for government work, yes. Problem is, family trees are products of the human mind…..with all the biases. but provides no clue as to what was the surname of that common forefather. Court records, probate, marriage, death…..all depend on that person’s perceived name. interest of a naughty mother to lie about the paternity of her child. Hi Blaine – nice write-up, a balance among different data types and relationships is important. How would you describe your ‘decision rule’ for confirming, validating or otherwise making a genealogical judgement? Is it a preponderance of the evidence, or is it the stronger beyond a reasonable doubt standard? A well-documented (evidenced) hypothesis seems at least as respectable as an unqualified but commonly accepted line. This is a great question, and I don’t have a great answer. When I evaluate a hypothesis after having gathered all the available evidence I think I can gather, I determine how likely I think it it is that the hypothesis is incorrect. If I think there is a very low likelihood that the hypothesis could be incorrect (based on the gathered evidence), then I will accept the hypothesis as a genealogical conclusion and move on. Not DNA, but after reading your article Blaine i’ve come to realize that it will be ideal when I add, for example, a new baptism record from the late 1600’s with the usual dates, names, places, source etc to my tree, I should also add a few sentences about the clarity of the entry. How easy is it to read the various pieces of crucial info within it – can it be compared to others on the page to bring about some sort of consistency or some doubt, or is their anything I can see and comment on to bring some sort of objectiveness to the entry. Thanks. I think that making notes about a source (secondary to a good citation, of course) is a great idea! I am very confused about the value (for myself) of DNA testing. Many people get very excited by it, but nothing I’ve read has convinced me that it will help with my research interests. If the records exist, then I don’t see DNA helping (unless, of course, there was some begetting in the wrong bed and DNA is enough to disprove a recorded relationship). If the records don’t exist beyond five or six generations (as in the case of my Irish and Jewish ancestors), then DNA isn’t going to help. In fact, I’ve read that DNA is even less helpful for Ashkenazi Jews because they are in any case closely related – and in my particular tree there are many marriages between cousins. My one major research question now is whether three men six generations back were brothers. I’m not convinced DNA from people living today will help to answer that. One piece of evidence I’ve never seen mentioned is that of family resemblence – which I suppose would back up DNA. It can be quite astounding to compare photos/portraits across branches and down generations and see members who jump out as belonging to the same tree. If I see that in two possibly related lines, maybe DNA testing is worth it? You are thinking of DNA as being something different from paper records, and you shouldn’t think of it that way. You say “[i]f the records exist…,” but DNA is one of those records. Just as you might consult census records, land records, passenger lists, or whatever other records you would normally consult, DNA should now be on that list. And yes, you don’t know what you’ll find before you test, but you don’t know what you find before you search the census, either. DNA is just another record type. Having DNA is like suddenly finding a surviving copy of the 1890 census; there’s no question that people would check the 1890 census if it was suddenly available, yet people are hesitant to check their DNA records. And I recommend ignoring all facial appearance comparisons. There is no good scientific data that I’m aware of that has established that it is useful for genealogy. Full siblings may look nothing alike, while strangers may look like twins. Over the years, I’ve been incorporating DNA testing into my genealogical research as well as exploring the fascinating science behind why and how it works. I don’t treat DNA evidence the same way I do the historical record. Documents are fallible records created by humans that are subject to error. People lie, omit information and create documents with biases. DNA is a kind of record that exists at the molecular level. If you share a set of genetic markers with any individual, you definitely share a common ancestor[s] somewhere in time before the random shuffling of Autosomal DNA each generation erases the evidence. You may not have the historical documents or enough information to determine the specific ancestor you share. For example, most of my mother’s ancestors born before 1865 were enslaved in different regions throughout the South. I share DNA markers with White-identified and Black-identified Americans all over the United States. Some, I have no way of knowing our common ancestor because the paper trail ends at a certain point or that if records do exist, they are spotty at best. The surnames of African-Americans are inconsistent because of slavery and migrations to other regions before an after the war. If anything else, my DNA matches confirm that the descendants of African slaves and European immigrants in the South intermingled for generations. Some of my DNA matches have confirmed years of genealogical research and oral history. I’ve even been able to discover unknown connections that revealed new ancestors after combining them with the paper trail. It’s been a fascinating exploration into my past really. Whenever I do research, I always consider oral, written and DNA as different kinds of evidence complete with their own set of limitations.